This article is about the men's team. For the women's team, see China women's national football team. The Chinese national football team (Chinese: 中国国家足球队), recognized as China PR by FIFA, is the national association football team of the People's Republic of China and is governed by the Chinese Football Association. The team is colloquially referred to as "Team China" (Chinese: 中国队), the "National Team" (Chinese: 国家队) or "Guózú" (Chinese: 国足, short for Chinese: 国家足球队; pinyin: Guójiā Zúqiú Duì; literally: 'national football team'). The Chinese Football Association was founded in 1924 by the Republic of China and joined FIFA in 1931. Following the Chinese Civil War, the Football Association was reformed by the newly founded People's Republic of China. They remained affiliated with FIFA until 1958, when they withdrew, but they rejoined the organisation in 1979. China has won the EAFF East Asian Cup twice in 2005 and 2010 and have been runners-up at the AFC Asian Cup twice in 1984 and 2004. Although China failed to score a goal in their FIFA World Cup debut appearance during the 2002 FIFA World Cup, losing all their matches, qualifying for the tournament has been considered the greatest accomplishment in the country's football history. Although modern football lacks a distinguished history in China, there were an estimated 250 million viewers for the 2004 AFC Asian Cup Final, which China lost 3–1 to arch-rivals Japan, the largest single-event sports audience in the country's history at that time. China's first ever international representative match was arranged by Elwood Brown, president of the Philippine Athletic Association who proposed the creation of the Far Eastern Championship Games, a multi-sport event considered to be a precursor to the Asian Games. 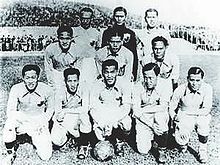 He invited China to participate in the inaugural 1913 Far Eastern Championship Games held in the Philippines, which included association football within the schedule. To represent them it was decided that the winner of the football at the Chinese National Games in 1910 should have the honour to represent the country, where it was won by South China Football Club. The clubs's founder and coach Mok Hing (Chinese 莫慶) would become China's first coach and on 4 February 1913 in a single one-off tournament game held in the Manila he led China to a 2–1 defeat against the Philippines national football team. The political unrest of the Xinhai Revolution that mired China's participation in the first tournament, especially in renaming the team as Republic of China national football team, did not stop Shanghai being awarded the 1915 Far Eastern Championship Games. Once again South China Football Club, now known as South China Athletic Association won the right to represent the nation. This time in a two legged play-off against the Philippines, China won the first game 1–0 and then drew the second 0–0 to win their first ever tournament. With the games being the first and only regional football tournament for national teams outside Britain, China looked to establish themselves as a regional powerhouse by winning a total of nine championships. The Chinese Football Association was founded in 1924 and then was first affiliated with FIFA in 1931. With these foundations in place China looked to establish themselves within the international arena and along with the Japanese national football team they were the first Asians to participate in the Football at the Summer Olympics when they competed within the Football at the 1936 Summer Olympics held in Germany. At the tournament China were knocked out within their first game at the Round of sixteen when they were beaten by Great Britain Olympic football team 2–0 on 6 August 1936. On 7 July 1937 the Second Sino-Japanese War officially erupted, which saw the relations between China and Japan completely eroded especially once it was announced that Japan would hold the 1938 Far Eastern Championship Games. The tournament would be officially cancelled while Japan held their own tournament called the Anniversary of the Japanese Empire, which included the Japanese occupied Manchukuo to represent China. None of the games during the Second Sino-Japanese War are officially recognized and once the war ended on 9 September 1945 China looked to the Olympics once again for international recognition. On 2 August 1948 China competed in the Football at the 1948 Summer Olympics where they were once again knocked out in the last sixteen, this time by Turkey national football team in a 4–0 defeat. When the players returned they found the country in the midst of the Chinese Civil War. When it ended, the team had been split into two, one called the Chinese national football team and the other called Republic of China national football team (later renamed Chinese Taipei national football team). China, under the newly instated People's Republic of China reformed the Chinese Football Association before having FIFA acknowledge their 1931 membership on 14 June 1952. Finland, who were one of the first nations to hold diplomatic relations with China's new government, invited the country to take part in the 1952 Summer Olympics. Li Fenglou would become the country's first permanent manager to lead them in the tournament, however unfortunately the Chinese delegation was delayed and they missed the entire competition, nevertheless the Finland national football team would still greet Li and the Chinese team with a friendly game on 4 August 1952 making it People's Republic of China's official first game, which ended in a 4–0 defeat. In preparation for entering their first FIFA competition, China sent a young squad to train in Hungary in 1954. However, when they entered the 1958 FIFA World Cup qualification process China were knocked out by Indonesia. On 7 June 1958, China stopped participating within any FIFA recognised football events when FIFA officially started to recognise the Republic of China as a different country. This sparked a diplomatic argument that had already seen China withdraw from the 1956 Summer Olympics for the same reasons. For years China would only play in friendlies with nations such as Albania, Burma, Cambodia, Guinea, Hungary, Mongolia, North Korea, North Vietnam, Pakistan, Sudan, the Soviet Union, and the United Arab Republic who recognized People's Republic of China as the sole heir to the China name. On 25 October 1971 the United Nations would recognise the country as the sole heir to the China name in their General Assembly Resolution 2758 act. In 1973 the team, which had been using the name Republic of China would rename themselves as Chinese Taipei. These acts would see China rejoin the international sporting community, first by becoming a member of the Asian Football Confederation in 1974 and by rejoining FIFA again in 1979. With the end of the Cultural Revolution and international recognition of their sovereignty finally acknowledged, Chinese sport would emerge from a traumatic period that greatly affected them socially and politically. The 1974 Asian Games reintroduced the Chinese football team back into international football while the 1976 AFC Asian Cup saw them have a relatively successful campaign where they came third. The Chinese national league restarted after being greatly affected by the political turmoil. Also the introduction of televisions in Chinese households reached 20 million sets by 1982, and with an audience of 350 million, it saw association football regain its popularity, rival and eventually takes over badminton and table tennis as the country's main spectator sport. In 1980, China participated in the 1982 FIFA World Cup qualifiers for a berth in the 1982 World Cup, but they lost a play-off game against New Zealand. During the 1986 FIFA World Cup qualifiers for the 1986 World Cup, China faced Hong Kong at home in the final match of the first qualifying round on 19 May 1985 where China only needed a draw to advance. However, Hong Kong produced a 2–1 upset win which resulted in riots inside and outside the stadium in Beijing. During the 1990 FIFA World Cup qualifiers for the 1990 World Cup, China again reached the final round of qualifying. They just missed out on qualifying as they conceded two goals in the final three minutes against Qatar in their final group match. During the 1994 FIFA World Cup qualifiers for the 1994 World Cup - when they were led by their first ever foreign manager, Klaus Schlapner - China failed to reach the final round of qualifying, coming second behind Iraq. China was on the verge of making it through the 1998 FIFA World Cup qualifiers for the 1998 World Cup, but lost crucial matches at home against Qatar and Iran. In 1987, the first Chinese footballers moved abroad when future national team player Xie Yuxin joined FC Zwolle (Netherlands) and ex-national teamer Gu Guangming joined SV Darmstadt 98 (Germany). In 1988, national team captain Jia Xiuquan and striker Liu Haiguang both joined FK Partizan (Yugoslavia). On 26 January 2000, China beat Guam 19–0 during the 2000 Asian Cup qualification which was the world record for the largest victory margin in an international football match at the time; however, the record was broken by Kuwait nineteen days later. On 7 October 2001, China, under the direction of manager Bora Milutinović, advanced to the 2002 FIFA World Cup which was the first time China had ever qualified for the FIFA World Cup. However, they failed to score a single goal at the tournament, lost all three group matches, and were subsequently eliminated in the group stage. Nonetheless, qualifying to the World Cup was deemed as China's greatest success ever in international stage. In November 2004, China failed to advance through the preliminary qualification stage for the 2006 World Cup, losing out to Kuwait on goal difference, despite China's seven goals against Hong Kong in the last qualifying match. Manager Arie Haan was later replaced by Zhu Guanghu after the qualification process. In August 2005, China won the 2005 East Asian Football Championship, its first ever international title, with a 1–1 draw against South Korea, 2–2 draw against Japan, and a 2–0 win against North Korea. During the qualification process for the 2007 AFC Asian Cup in 2006, the team became the subject of immense criticism and national embarrassment in the media when they had managed to score only one goal, Shao Jiayi's penalty kick during injury time, against Singapore at home and only managed a draw with Singapore in the away game. During preparations for the 2007 AFC Asian Cup, the team spent the weeks leading up to the tournament on a tour of the United States. While the 4–1 loss to the United States was not unexpected, a 1–0 loss to Major League Soccer side Real Salt Lake which finished bottom of the league in the 2007 season caused serious concern. During the 2007 AFC Asian Cup, the team played three group matches, winning against Malaysia, drawing with Iran after leading 2–1, and losing 3–0 to Uzbekistan. After high expectations, China's performance at the tournament drew immense criticism on online communities which condemned the manager, the players, and even the Chinese Football Association. Zhu was later replaced as manager by Vladimir Petrović after the poor performances. Some commented that China's reliance on foreign managers for the past decade had been an indicator of its poor domestic manager development. In June 2008, China failed to qualify for the 2010 FIFA World Cup, losing against Qatar and Iraq at home. After the 2008 Summer Olympics, Petrović was sacked as the manager and Yin Tiesheng was announced as the team's caretaker. In April 2009, China appointed the young Gao Hongbo as the new manager, replacing Yin Tiesheng. His arrival saw China opt for a new strategy, turning towards ground passing tactics and adopting the 4–2–3–1 formation. It was noted that Chinese footballers had relied too heavily on the long ball tactic for almost a decade. Wei Di, the chief of the Chinese Football Association, stressed that, "Anytime, no matter win or loss, they must show their team spirit and courage. I hope, after one year's effort, the national team can give the public a new image." Under Gao, China drew its first game against Germany 1–1 in May 2009. Afterwards, China were able to gain 13 points in the during the qualification process for the 2011 AFC Asian Cup. This led to a revival in interest amongst some Chinese football fans as China had also won 1–0 against France in June 2010 as well as holding 2010 FIFA World Cup quarter-finalists Paraguay to a 1–1 draw in September 2010. This led to some supporters even thinking that reaching the semifinals of the 2011 AFC Asian Cup was possible; however, China were knocked out in the group stages during the 2011 AFC Asian Cup. This led to some discontent amongst Chinese fans and it seemed that this was the reason that eventually led to the sacking of Gao as manager by the Chinese Football Association. Although Gao's winning percentage (65%) was the highest for a Chinese manager since Nian Weisi (67.86%) as well as the team having not lost since the end of the 2011 AFC Asians Cup, this was still not enough to convince the Chinese Football Association of replacing Gao. In August 2011, he was formally sacked as manager and replaced by José Antonio Camacho, less than a month before the qualification process for the 2014 FIFA World Cup. But corruption still remained a major problem in Chinese football and in 2010, Wei admitted that, "Chinese football has degraded to an intolerable level. It has hurt the feelings of fans and Chinese people at large." He also added that he was confident in being able to aid Chinese men's and women's football return to the leading status in Asia and world respectively in the future. Wei pointed out six major problems which had caused the "huge slump" of Chinese football in the past few years while he dissected the dwindling pool of youth player selection as being a big problem along with unhealthy professional leagues affected by gambling and match-fixing scandals. On 13 August 2011, José Antonio Camacho was appointed as the new manager of the team, signing a three-year deal for a reported annual salary of $8 million. Wei Di, the chief of the Chinese Football Association, explained the decision as being part of a long-term plan to help the country catch up with rivals Japan and South Korea. He noted that, "Compared with our neighbours Japan and South Korea, Chinese football is lagging far behind, we need to work with a long-term view and start to catch up with a pragmatic approach. A lot of our fans expect China to qualify for the 2014 World Cup finals in Brazil. They are afraid that changing the coach at the last moment may cause bad effect to the team's qualifying prospect. I can totally understand that. But we do not have any time to waste." Yu Hongchen, the vice-president of the Chinese Football Administrative Centre, also stated, "The qualifying stage of 2014 World Cup is just a temporary task for him. Even if the task is failed, Camacho will not lose the job. When we started to find a new coach for the national team, we mainly focus on European countries such as Germany, the Netherlands and Spain. First of all, they have advanced football concepts, and secondly they have a productive youth training system, which we can learn from. We hope he can help us to find a suitable style." However, China failed to qualify for the 2014 FIFA World Cup, after only finishing third place in the third round of qualifying during the 2014 FIFA World Cup qualification, with three wins and three losses out of six games played. In June 2012, during a friendly match against Spain, many football experts and pundits alike expected Spain to easily steamroll China. However, many critics were stunned to find China and Spain still deadlocked 0–0 until the 84th minute when a goal from David Silva won the match 1–0 for Spain. Even though they lost, this performance was viewed highly in the media. However, disappointment would soon strike again two months later when China faced Sweden in a friendly only to lose 1–0 with the lone goal coming minutes after the second half. Several months later, Camacho managed a youthful team to an 8–0 loss against Brazil on 10 September 2012 which would go on record as China's worst ever international defeat in the team's history. This massive loss also succumbed China to their worst ever FIFA ranking (109th). It was the worst defeat for China since their loss to the United States in 1992. After a disappointing qualification process for the 2014 FIFA World Cup, Camacho led China during their qualification process for the 2015 AFC Asian Cup where in the first group match China lost 2–1 to Saudi Arabia. Camacho then managed China on 15 June 2013 against Thailand in a shocking 5–1 loss to a team ranked 142 and 47 places below China. This embarrassing loss then saw Camacho subsequently sacked a week as manager after immense pressure from the media with Fu Bo assigned as the caretaker. After Alain Perrin was announced as the new manager in March 2014, China continued through the qualification process for the 2015 AFC Asian Cup, qualifying for the tournament by being the best third-placed team. After undergoing a ten match unbeaten streak before the tournament, China won their first group match of the tournament 1–0 against Saudi Arabia through a deflected free kick from Yu Hai. They won their second group match 2–1 against Uzbekistan and subsequently qualified for the knockout stage as the group winner. This was the first time in eleven years that China were not eliminated during the group stage. China won 2–1 against North Korea in their final group match; however, the team was knocked out by in a 2–0 loss against Australia during the quarterfinals. After Perrin was sacked for the team's poor performance at the 2018 FIFA World Cup qualifiers, former coach Gao Hongbo returned to the role on 3 February 2016. In his first two matches, Gao secured the team's passage to the final Asian qualifying round by beating the Maldives and Qatar to overtake Hong Kong to second. This also secured China PR's qualification for the 2019 AFC Asian Cup. China started their World Cup hunt by a 2–3 defeat to South Korea, which China almost made a comeback after being led three goals, which was praised by press and medias for its valiant efforts; and China's impressive performance continued with a 0–0 draw to AFC's highest ranked team Iran at home, leading its supporters to be enthusiastic over China's position for the World Cup in Russia. However, what followed later was a complete shock, as China lost 0–1 at home to Syria and 0–2 away to Uzbekistan. After losing to Uzbekistan 0−2 in October 2016, Gao Hongbo resigned. His team had been winless in the first four matches of the final qualifying stage for the World Cup, including an embarrassing home loss to Syria which was widely criticised by fans. On 22 October 2016, Marcello Lippi was appointed manager of the team ahead for the last remaining matches. His first task was up against Qatar, where China drew 0–0 at home to the Middle Eastern opponent, as the fans, having lost enthusiasm with what happened at four beginning matches, started to question over the team's ability. Lippi decided to revamp the team and China's performances improved greatly. China defeated South Korea 1–0 for the first time in a FIFA-sanctioned tournament, amidst the heat of tensions over South Korea's deployment of THAAD which was seen by China as a threat. The victory against South Korea led China's slim hope alive, only to found themselves lost 0–1 away to Iran. China's chance turned slimmer with a 2–2 draw to Syria, forcing China to win the last remaining matches while hoping Syria unable to do something surprise. China did it well by winning 1–0 over Uzbekistan at home and Qatar 2–1 away; but following Syria's 2–2 draw with Iran, the team was not able to be qualified for the 2018 World Cup under his tenure, but improvements could be seen from China's performances. Lippi signaled in early 2018 that he would depart after the 2019 Asian Cup, previously had stated that China would be his last team on his coaching career. Lippi led the side during the final stage of the 2019 AFC Asian Cup, where China won 2–1 to Kyrgyzstan and 3–0 to Philippines, before losing 2–0 to group leaders South Korea on 16 January. China then beat Thailand 2–1 to earn a place in the quarter-finals, where the Chinese team was knocked out by Iran after a 3–0 defeat; Lippi subsequently confirmed his departure as head coach. On 15 March 2019, Cannavaro was appointed manager of China, in conjunction with coaching Guangzhou Evergrande. Wikimedia Commons has media related to China national football team kits. China's home kit is traditionally all red with a white trim while their away kit is traditionally an inverted version of the home kit, fully white with a red trim. During the 1996 AFC Asian Cup, China employed a third kit which was all blue with a white trim and was used against Saudi Arabia during the tournament. The team has also started to use cooling vests in certain warmer climates. After decades of having Adidas producing the team's kits, China's current kit has been produced and manufactured by Nike since 2015. China plays in various stadiums in the country, and doesn't have a permanent home stadium. Workers' Stadium, opened in 1959, located in the Chaoyang District in north-eastern Beijing, is the most renowned one. Its capacity is 66,161, and it covers a land area of 350,000 square meters. It is used both for international matches and by the China Super League team, the Beijing Guoan, and for the national team. However, China also plays in other stadiums around the country. Tuodong Stadium on the city of Kunming has the capacity of 40,000 and was used in previous 2010 and 2014 World Cup campaigns. Yellow Dragon Sports Center in Hangzhou served as China's main stadium for the 2011 AFC Asian Cup qualification and Shaanxi Province Stadium in Xi'an served as Team Dragon's main stadium for the 2015 AFC Asian Cup qualification. Previously, Shenyang's Wulihe Stadium was served as the base for China's historic 2002 FIFA World Cup campaign, which saw China qualified, and their only, World Cup appearance. In smaller tournaments like EAFF E-1 Football Championship, Chongqing Olympic Sports Center in Chongqing, and Wuhan Sports Center Stadium in Wuhan were used as home stadiums for Team Dragon. The recent China Cup also represents Guangxi Sports Center in Nanning as the team's main stadium. Traditionally, China's greatest rival has been Japan. This was exemplified after Japan beat China 3–1 in the 2004 AFC Asian Cup Final when Chinese fans began to riot near the north gate of the Worker's Stadium. The rioting was said to be provoked by controversial officiating during the tournament and the heightened anti-Japanese sentiment at the time. China's most recent tournament meeting with Japan was at the 2017 EAFF E-1 Football Championship where Japan won 2–1. China went on to finish as third-place in the tournament, while Japan finished 2nd. Another well known rivalry is also with fellow neighbour South Korea. China played 27 matches against South Korea between 1978 and 2010, a span of 32 years, without winning a single match (11 draws and 16 losses). The media coined the term "Koreaphobia" to describe this phenomenon, but China finally registered its first win against South Korea on 10 February 2010, winning 3–0 during the 2010 East Asian Football Championship and eventually going on to win the tournament. A rivalry with Hong Kong has been created due to political tension during 2018 World Cup qualification. With Hong Kong fans booing the Chinese national anthem, which Team Hong Kong share with Team China, 2018 World cup qualifier matches were also very tense with both matches resulting in 0–0 draws. Prior to the rivalry buildup, Hong Kong was not considered as a worthy opponent due to lack of success comparing to China. Home and away matches are typically shown on CCTV-5, CCTV-5+, GDTV-Sports, STV-Sports, BTV-6, and several other local sports channels in mainland China. The following players were the 23-man squad for 2019 China Cup. Caps and goals are correct as of 25 March 2019, after the match against Uzbekistan. As of 20 January 2019; counted for the FIFA A-level matches only. All matches before the founding of Chinese Football Association in 1924 are not counted as A-level match by FIFA. This list consist of Olympic Games, Olympics qualification and matches between 1913 and 1923, but all of them will be deleted from list. All matches before the founding of Chinese Football Association in 1924 are not counted as A-level match by FIFA.counted for the FIFA A-level matches only. China will be the third team from outside the Americas to participate in the Copa América, and will be invited for the first time in 2020. China went without a manager until 1930 and the establishment of the national team only occurred when it came to international sporting events. ^ Includes North Vietnam and South Vietnam before 1975. ^ "China beat Qatar; World Cup dream still on for Team Dragon". as.com. 29 March 2016. Retrieved 30 September 2016. ^ "China matches, ratings and points exchanged". World Football Elo Ratings: China. Retrieved 18 November 2014. ^ "China PR: Profile". FIFA. Retrieved 30 September 2016. ^ "Asian Cup final smashes viewing records". The AFC. 18 October 2007. Retrieved 7 June 2011. ^ "FAR EASTERN CHAMPIONSHIP GAMES". ocasia.org. Retrieved 23 August 2016. ^ "China 1910". rsssf.com. 22 October 2009. Retrieved 23 August 2016. ^ "南華體育會創辦人 莫慶". beyondnewsnet.com. 2 December 2014. Retrieved 23 August 2016. ^ "Second Far Eastern Games 1915 (Shanghai)". rsssf.com. 28 January 2011. Retrieved 23 August 2016. ^ "Far Eastern Games". rsssf.com. 12 December 2011. Retrieved 23 August 2016. ^ "Olympic Football Tournament Berlin 1936 > Great Britain – China PR 2:0 (0:0)". fifa.com. Retrieved 23 August 2016. ^ "OSAKA 1938". ocasia.org. Retrieved 23 August 2016. ^ "2600th Anniversary of the Japanese Empire 1940 (Tokyo)". rsssf.com. 29 November 2012. Retrieved 23 August 2016. ^ "Olympic Football Tournament London 1948 > Turkey – China PR 4:0 (1:0)". fifa.com. Retrieved 23 August 2016. ^ "1949年-1979年中国足球国家队大事记". sports.163.com. 19 March 2007. Retrieved 31 August 2016. ^ "China PR 0–4 Finland". teamchina.freehostia.com. 31 October 2004. Retrieved 31 August 2016. ^ "China sends U20s to train abroad, gets foreign coach, fails to qualify for World Cup - Wild East Football". wildeastfootball.net. Retrieved 9 June 2018. ^ a b "China National Football Team Database". China National Football Team Database. Retrieved 7 July 2010. ^ "1949年-1979年中国足球国家队大事记". 360doc.com. 19 March 2007. Retrieved 31 August 2016. ^ "10th–15th Olympic Summer Games: 1936–1952". en.olympic.cn. 30 March 2004. Retrieved 31 August 2016. ^ United Nations General Assembly Session 26 Resolution 2758. Restoration of the lawful rights of the People's Republic of China in the United Nations A/RES/2758(XXVI) page 1. 25 October 1971. Retrieved 31 August 2016. ^ "Chinese Taipei Football Association Introduction". www.ctfa.com.tw. 20 April 2011. Retrieved 31 August 2016. ^ "AFC BARS ISRAEL FROM ALL ITS COMPETITIONS". Reuters. The Straits Times. 16 September 1974. Retrieved 31 August 2016. ^ "The road to becoming an international sports power". China.org.cn. 11 September 2009. Retrieved 20 September 2016. ^ Zhouxiang, Lu (21 June 2016). "Sport and Politics: The Cultural Revolution in the Chinese Sports Ministry, 1966–1976". The International Journal of the History of Sport. 33 (5): 569–585. doi:10.1080/09523367.2016.1188082. ^ "Asian Nations Cup 1976". rsssf.com. 19 January 2007. Retrieved 20 September 2016. ^ "China League History". rsssf.com. 22 October 2009. Retrieved 20 September 2016. ^ Link, Perry (2000). The Uses of Literature: Life in the Socialist Chinese Literary System. Princeton University Press. p. 208. ISBN 9780691001982. ^ "Let professionals run Chinese soccer". south china morning post. 19 February 2012. Retrieved 20 September 2016. ^ "Ninety minutes from glory: China's 1982 World Cup qualifying campaign - Wild East Football". wildeastfootball.net. Retrieved 3 December 2017. ^ "The 5.19 incident: China's doomed attempt to qualify for Mexico'86 - Wild East Football". wildeastfootball.net. Retrieved 3 December 2017. ^ "The black three minutes which denied China a place at Italia'90 - Wild East Football". wildeastfootball.net. Retrieved 31 December 2017. ^ "Klaus Schlappner: China manager - Wild East Football". wildeastfootball.net. Retrieved 9 June 2018. ^ "A FOREIGN FIELD: JIA XIUQUAN AND LIU HAIGUANG AT PARTIZAN". IBWM. Retrieved 9 June 2018. ^ "China National Football Team Database – China PR 1–4 USA". Teamchina.freehostia.com. 2 June 2007. Retrieved 2 December 2013. ^ "MLS 2007 : Summary". Betexplorer.com. Retrieved 2 December 2013. ^ China Daily. Jobless Haan reflects China's football crisis. 20 November 2004. ^ a b "New boss vows to revive China's football in 5 years". CHINAdaily. 2 February 2010. Archived from the original on 6 June 2011. Retrieved 7 June 2011. ^ "FIFA World Cup News, Results, Fixtures". Sky Sports. Archived from the original on 18 October 2012. Retrieved 2 December 2013. ^ "Camacho To Be New Coach of China National Football Team". The China Times. 20 November 2013. Retrieved 2 December 2013. ^ a b "Jose Antonio Camacho's appointment is part of a long-term revival plan: China Football Association head Wei Di". Goal.com. 15 August 2011. Retrieved 2 December 2013. ^ "Match Report: Brazil 8–0 China". Goal.com. Retrieved 2 December 2013. ^ "Summary – Asian Cup Qualification – Asia – Results, fixtures, tables and news – Soccerway". Uk.soccerway.com. 9 January 2013. Retrieved 2 December 2013. ^ "South Korea 3 China 2: Hosts hang on to claim winning start". September 2016. ^ "China held by Iran in World Cup qualifier". 6 September 2016. ^ "Chinese fans angry over loss to Syria". BBC News. 7 October 2016. ^ "马塞洛·里皮就任中国男足国家队主教练" (in Chinese). 22 October 2016. ^ "Cina, Lippi è il nuovo commissario tecnico" (in Italian). 22 October 2016. ^ "Official: Lippi new China coach". Football Italia. 22 October 2016. Retrieved 22 October 2016. ^ "China beats South Korea 1-0 in 'football war' played in front of 10,000 police officers". 23 March 2017. ^ "China draw Syria 2-2 in FIFA World Cup qualification - Xinhua | English.news.cn". ^ "China's faint World Cup hopes vanish despite win in Qatar". 5 September 2017. ^ "Lippi bows out as Iran send hapless China packing from the Asian Cup". smh.com.au. 25 January 2019. ^ "Official: Lippi leaves China". Football Italia. 25 January 2019. ^ "足协:选卡帅经过慎重研究 武磊还在适应西甲没征召". 15 March 2019. ^ "( السعودية 4 – 3 الصين ) ربع نهائي كأس آسيا 1996" (in Arabic). YouTube. 7 February 2009. Retrieved 2 December 2013. ^ Minter, Adam. "Why Chinese Hate Their Men's football Team". Bloomberg. Retrieved 2 December 2013. ^ a b All matches before the founding of Chinese Football Association in 1924 are not counted as A-level match by FIFA. ^ The Great Britain Olympic football team's matches at the 1936 Summer Olympics are counted as England's FIFA A-level match. ^ "China team stats (caps)". Team China. ^ a b Roberto Mamrud. "China – Record International Players". Retrieved 9 August 2013. ^ "China team stats (goals)". Team China. ^ Also as a player. Wikimedia Commons has media related to China national football team.